Saturday was a cold day and the boys and I stayed at home and they spent the day in their pjs. By mid-afternoon Juliana had already been to the hair salon for a trim and to the movies to see Beauty and the Beast. She wanted a popsicle and I told her to wait for her brothers to wake-up from their nap. I brought them downstairs and we went straight to the kitchen. 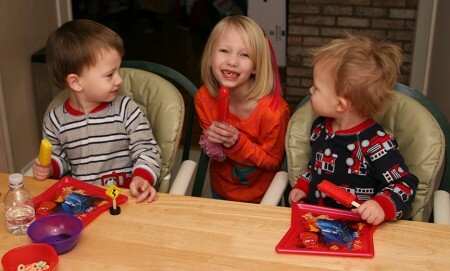 The boys were so excited and I watched the three of them laughing and enjoying their popsicles. Juliana was standing between them (she wanted to be next to Ruslan since they both had red) so I grabbed the camera. I am always watching for that elusive opportunity when all three of them are looking at me; this wasn’t it. I was trying to get their attention but the boys wouldn’t look away from Juliana, she was making faces and mommy is not as entertaining. 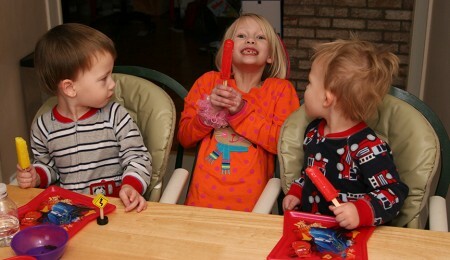 Juliana being silly, a Saturday pajama day, and Ruslan and his awesome bedhead. Since I downloaded the photos Saturday night I can’t stop looking at these two. While far from the perfect photos, they are a perfect picture of life with these three. That IS pretty sweet bedhead. i love that you see the perfect in the imperfect.